You might think from all the recipes you see posted on Just One Donna that cooking is my favorite thing to do. I like to cook when I have the time to devote to my favorite recipes, but I have a lot going on in my life and time to cook is often sacrificed. When I'm pressed for time, cooking frustrates me. Can you relate? I am committed to preparing as much of what we eat myself. I believe that you should know what goes into the food you put in your body. That means that we seldom eat prepared foods and restaurant meals are only occasional. This means that when I am pressed for time, I turn to my freezer. 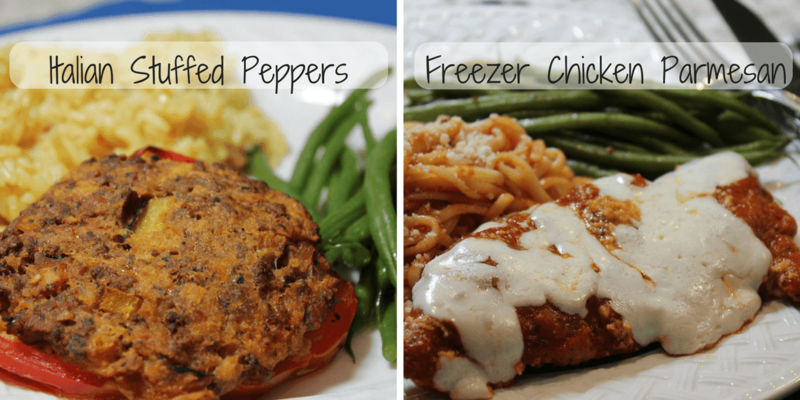 The two meals you will always find in my freezer, ready to heat and serve, are my Italian Stuffed Peppers and my Easy Freezer Chicken Parmesan. We've all seen the recommendations that tell us to make ahead our dinners on the weekend. Well, that's a good idea if you want to spend your weekends in the kitchen. I do not. Instead, I plan to cook each of these meals in a big batch quantity periodically. For the stuffed peppers, that means I'll make a batch of approximately twenty stuffed peppers once every three or four months. The chicken Parmesan gets cooked approximately once every six weeks, making enough for four meals. 1. 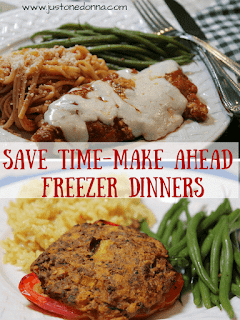 Decide how many meals you want to have on hand, first making sure you have enough room available in your freezer. 2. Plan when it will fit in your schedule to make these meals in a batch. I always plan to make my big batch on the same day I'll be serving one of these meals for dinner. That way, I'll only be adding a little extra time onto my normal preparation time for dinner. I usually plan for double the usual preparation time, including the wrapping for freezing. 3. It's smart to include another family member in your freezer meals preparation. Hubby and I usually work together when we make the stuffed peppers. This helps to make the chopping step go faster and filling the peppers with the stuffing mixture a breeze. This is also a great time to teach kids basic cooking skills. 4. Shop in advance for the ingredients and freezer supplies. You do not want to make a grocery store run during batch cooking sessions. 5. Congratulate yourself for your time-saving meal preparation every time you reach into your freezer for one of your meals. I wrap each of the stuffed peppers individually in plastic wrap and then put them all together into a plastic freezer bag. That way I can take out as many as needed for dinner. 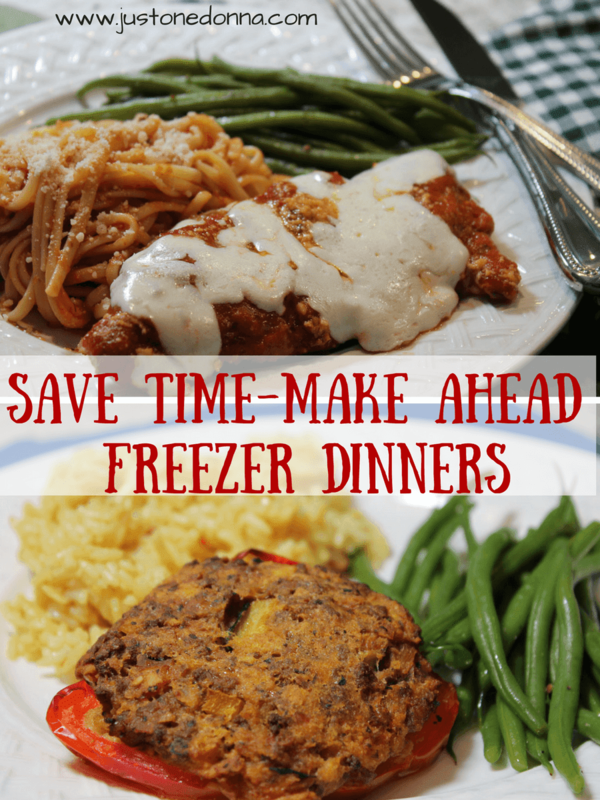 I freeze the chicken Parmesan in baking dishes that can go from the freezer to the oven. I usually try to defrost both the stuffed peppers and chicken Parmesan before baking, but I have been known to cook them straight from the freezer. They'll just take a little longer to cook. Both of these recipes are family favorites. I hope you'll try them. You can either eat them for dinner or freeze them. How great is that? Thanks for sharing this post on Facebook, Twitter, Pinterest, or Yum!